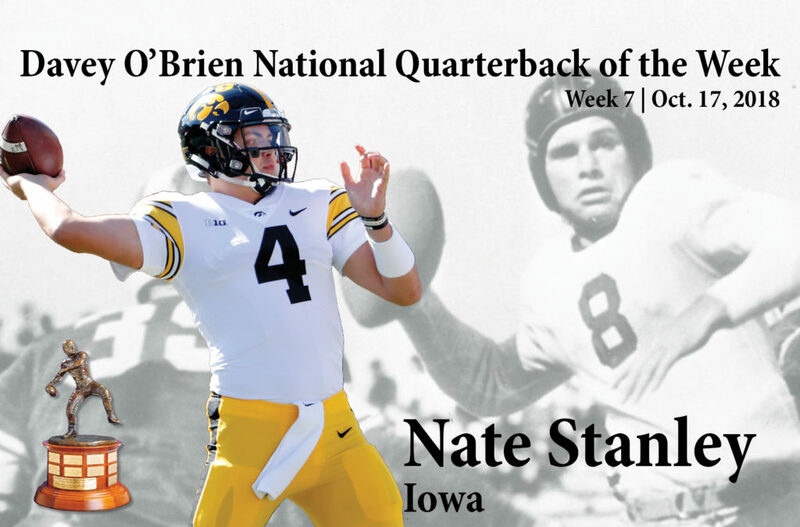 FORT WORTH, Texas (Oct. 17, 2018) – Iowa junior Nate Stanley has been named the Davey O’Brien National Quarterback of the Week for week seven, the Davey O’Brien Foundation has announced. In a 42-16 victory over Indiana on Saturday, Stanley completed 21 of 32 passes (65.6 percent) for 320 yards and a career-best six touchdowns. 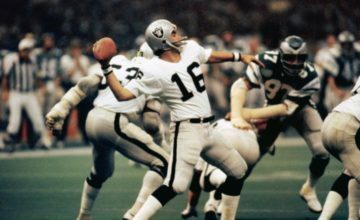 The six touchdown passes rank as the second most in a game in school history, matching 1985 Davey O’Brien National Quarterback Award winner Chuck Long. Stanley’s 300-yard passing game was his third in his last four outings. The native of Menomonie, Wis., has thrown 14 touchdown passes in his last four games, tying Long for the most ever by a Hawkeye in a four-game span. This week, Stanley has also been named the Walter Camp National Offensive Player of the Week and Big Ten Co-Offensive Player of the Week. Stanley is the first Big Ten Conference quarterback to be named the Davey O’Brien National Quarterback of the Week this season. 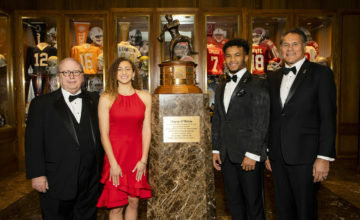 The Punt & Pass Podcast hosted by Drew Butler and Aaron Murray will discuss Stanley’s achievement on Thursday’s edition of the show. 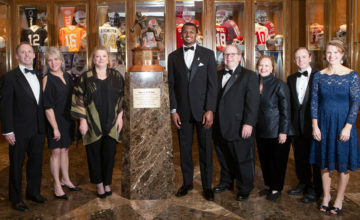 The other Great 8 quarterbacks in the season’s seventh week were: LSU’s Joe Burrow, Jarrett Guarantano of Tennessee, Utah’s Tyler Huntley, Jordan Love of Utah State, FIU’s James Morgan, Andre Nunez of Louisiana and Iowa State’s Brock Purdy.